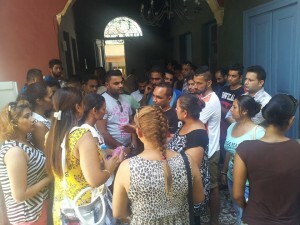 It was with utter dismay and sadness that we were informed that last Sunday, 2 August, Ms R.K., a young woman from India, was found dead in Larnaca below the balcony of her fifth floor workplace and employer’s residence, where she worked as a domestic worker. The attempt to attribute the cause of the young migrant woman’s death to suicide reminds us of the case of another young migrant woman, Oxana Rantseva who, in March 2001, was also found dead below the balcony of the apartment where she lived in Limassol. In the Rantsev case, the European Court of Human Rights (ECtHR) in a historic decision, nearly ten years after her death (07/01/2010), condemned the Republic of Cyprus for violation of Articles 4 – Prohibition of slavery and forced labor and 2 – right to life. This conviction for Cyprus by ECtHR was mainly based on the failure of the Cypriot state to put in place an appropriate legal and administrative framework to combat trafficking in human beings (status of workers in the cabarets and their working conditions) and the inadequate investigation of the circumstances of her death by the Cyprus Police. KISA, over the past few days received information which raised many questions about the circumstances of the recent death of R.K. According to confirmed information the employer forbade the deceased to leave the apartment. The decease’s friends visited on Sunday 2nd of August, only a few hours prior to her death with the intent of trying to convince the employer to let R.K. go with them to the Indian Mosque to exercise her religious rights, this the employer refused. About an hour later, the R.K was found dead under the balcony of the apartment. The employer in consultation with “the agent” had brought R.K. to the bank to withdraw R.K. savings. The passport and said savings were to be held at the office of “the agent” until Monday when R.K. was to be sent back to her home country. The employers have changed domestic work several times lately, where reason given by the works have been harsh conditions and degrading treatment by the employer. The Forensic evidence which shows that the young migrant while falling from the apartment hit several of the railings of the balconies below makes the possibility of suicide unlikely. Therefore the assumption that the death was either the result of a crime or an accident that happened while S.K. tried to escape from the apartment where she was held against her will. It is worth nothing that throughout this whole investigation never was the Department of Labour called in, which is standard procedure when a death happens at the person’s place of work. The parallelism of Rantsev case and R.K., is reasonable since in this case as well, there is illegal deprivation of liberty of individuals who with the connivance and consent of the authorities assume roles and powers that are in the responsibility of State services. At the same time, the status of domestic workers as was set by the state makes domestic workers, as in the past workers with the «artist» residence and working permit, vulnerable to trafficking and exploitation at work to the extent of a modern slavery. It is worth mentioning that R.K came to Cyprus to work for another employer, after having paid a very large sum to intermediaries in order to work in Cyprus ,a fact that made her voluntary return to her country impossible. The young migrant “moved” from the original employer, after a confirmed incident of sexual harassment by her employer, but the “agent” never complained about it to the police. When moving to the new employer, she was told that she no longer could change employer and in the case of “another failure” would be sent back to her country, something which increased the captivity conditions in which she was forced to live and work. For an independent forensic team to re-examine all the evidence and present their conclusion to truly learn the cause of her death. The investigation of the case by a specialized team and department of the police. The government to review the migration regime for domestic workers and initiate a public dialogue with all stakeholders for the adoption of a new framework governing the residence and employment of domestic workers, which should abide by the international conventions and other instruments for the protection of the employment and human rights of domestic workers, including the ILO Convention for Domestic Workers. It should also be noted that, despite the authorities’ declarations and statements, domestic workers, in contrast to all other migrants in other jobs, fall under the responsibility of the Ministry of Interior and not the Ministry of Labour, Social Insurance and Welfare. * in the above picture, compatriots of the young migrant at the offices of KISA (04/08) – calls for an investigation into the circumstances surrounding her death.